When viewers encounter paintings, sculptures and other visual representations of President Barack Obama 100 years from today what will they see? How will the visual culture of our era portray the first African American U.S. president—the man and his era—to fututre generations? The opportunity to describe, define and interpret Obama’s legacy inspired Peter Kaplan of Our World, LLC and the Charles H. Wright Museum of African American History, Detroit, MI. to organize the exhibition, Visions of Our 44th President. Visions of Our 44th President is in many ways an ideal exhibition for The Wright Museum for the intersection of history and art is a crossroads The Wright regularly invites its visitors to explore…. It is with reverent recognition of the present-day historical importance of the first African-American president of the United States of America, and the opportunity to showcase the amazing work of talented artists, which the Wright feels the utmost pride in partnering on this exhibit. 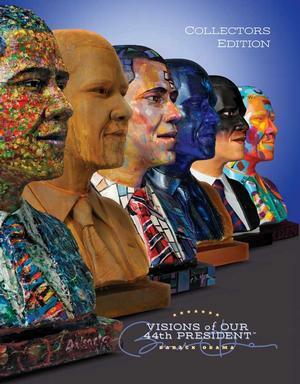 Visions of Our 44th President was a hit at its debut in 2012, and will only grow in stature as it travels to illustrious institutions in the years to come. 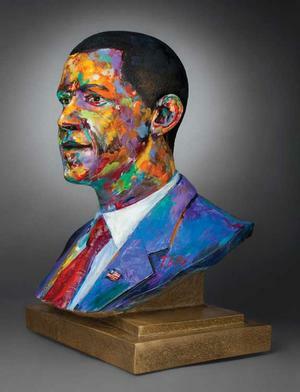 Forty four contemporary African American artists were selected by the exhibition partners to give their unique aesthetic treatments and visions to a single, life-sized bust of President Obama. 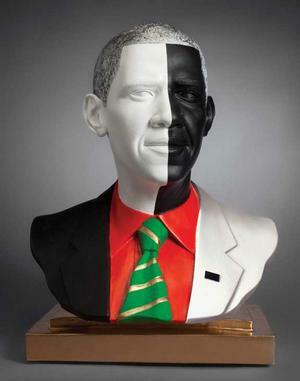 As artistic director for one of Obama’s official campaign posters in 2008, Kaplan envisioned the current exhibition and found a partner for its realization in the Charles H. Wright Museum of African American History. In the artfully illustrated Collectors Edition catalog that accompanies the show, he notes, "four years in the making, this unprecedented undertaking portrays a present-day historical achievement in world history through contemporary art." 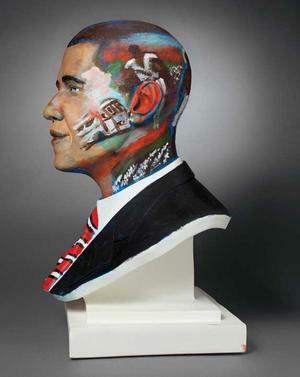 (It provides) a unique…platform for 44 talented African American artists to express their ideas about the character and complexity of President Barack Obama while celebrating the singular importance of this period in our country's history. 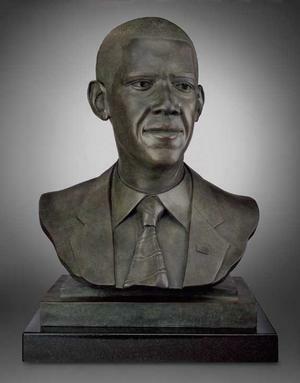 By using a bronze bust of the president as a three dimensional "blank canvas" as it were, each artist has interpreted with total imaginative freedom the persona of the first African American president of the United States in strikingly varied visual terms that evoke in the viewer a range of emotions which include pride, contemplation, amusement, curiosity, inspiration, and personal determination… I thank Peter Kaplan for developing this important project which contributes to the legacy of our 44th president in a monumental manner. It is an honor for the University Museum at Texas Southern University to be the first HBCU to participate in this landmark exhibition. Visions of Our 44th President will continue to inspire and empower countless generations of the future. 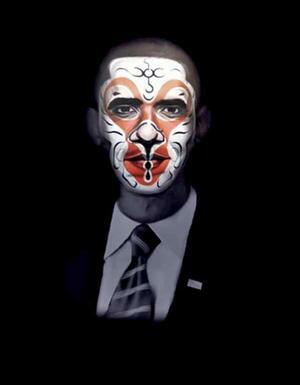 Each participant in the Visions show treats issues which define Obama and his presidency with the creativity one might expect of artistic practitioners with visual legacies of their own now prevalent. Consider, for instance, Barkley Hendricks’s bust “All Sides” which depicts Obama as "the embodiment of the people, the coming together of black and white and ultimately a symbol of unification" through treatment with his signature black, red and green palette. 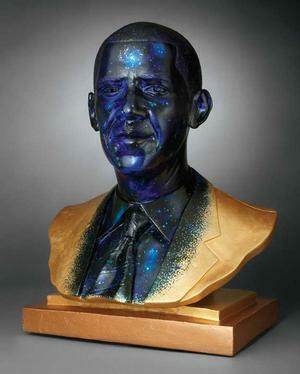 Or, Kadir Nelson’s transformation of his Obama bust into a manifestation of man as cosmos—universal being. Carrie Mae Weems’s work in the exhibit, Transition (3D projection) envisions President Obama as an entity born of conservative extremism by projecting 3D video images onto his representation with themes that explore demagoguery and unfounded critiques surrounding his presidency. 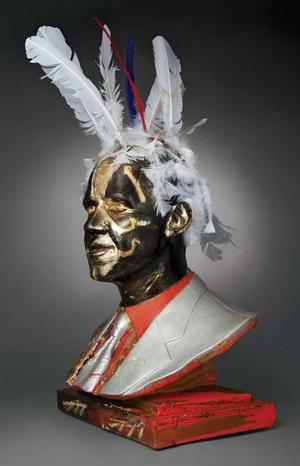 Or, contemplate the interplay between reverence and revulsion depicted by the Afro-Caribbean treatment of feathered adornment in Angelbert Metoyer’s visually arresting presentation here. 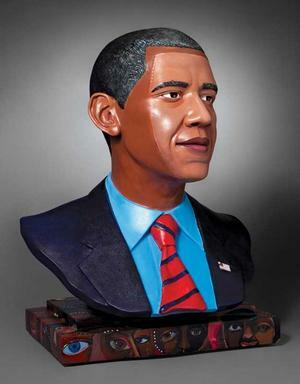 Each of the forty four busts in Visions encapsulates an aspect or thread of Obama’s presidency within its early 21st century social and political context for viewers of tomorrow. These works will help future generations interpret and decode the various meanings of the first black presidency in America. 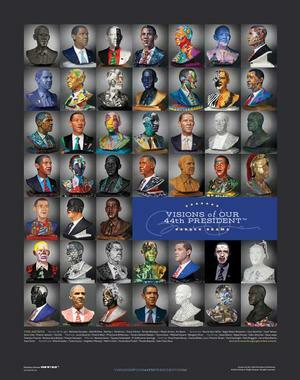 Visions of Our 44th President is now available to museums and galleries throughout the nation. The most recent announcement on this thought-provoking endeavor is that its next venue will be The Black Archives, History and Research Foundation of South Florida located in the historic Overtown section of Miami. Founded in 1977 and housed in the Historic Lyric Theater Cultural Arts Complex (National Register of Historic Places, built in 1913), the Black Archives has become the leading example of how historic preservation and cultural arts can play an important part in changing the lives of the people in the community it serves. The exhibition’s run there is timed to coincide with Art Basel in Miami Beach (December 1 – 4) and will stay on view throughout Black History Month during February 2017. The Association of African American Museums (AAAM) Annual Conference (August 3-6) held this year in Riverside, California is an incubator for innovation which affords African American museums and its professionals the occasion for informal discussions and strategic thinking in an intimate and welcoming atmosphere. "Competitive facades disappear here making way for conversations that often result in strategic partnerships, collaborations, and elevation of one’s institution," says Auntaneshia Staveloz, Vice President of the AAAM Board, and Supervisory Program Manager with the Office of Strategic Partnerships, Smithsonian Museums of African American History and Culture (NMAAHC), which supports AAAM annual conferences. "People make lifelong connections that are ever evolving and serve to add value to institutional and individual contributions within the museum field," Staveloz continues. "(The conference) has an intimate family reunion feeling where colleagues are coming home to a place where they can reunite with friends, let down their hair and speak candidly about their successes, challenges, and outright frustrations." The collegial and beneficial AAAM atmosphere described by Staveloz is the congenial space where ideas and discussions lead to the realization of the Visions exhibition. At AAAM, Timothy A. Barber, Executive Director of The Black Archives History and Research Foundation of South Florida; and LaNesha DeBardelaben, Senior Vice President, Charles H. Wright Museum of African American History identified synergies between the end of Obama’s presidential term; the presence of many collectors of African American art attending Art Basel; and the significance of an exhibition venue at The Black Archives History and Research Foundation location in the well-known Overtown section of Miami. The show’s run (November 30, 2016 – February 28, 2017) is timed to coincide with Art Basel in Miami Beach (December 1 – 4) and will stay on view throughout Black History Month during February 2017. "The diversity of the artists and the variations of styles represented in Visions mirrors the cultural essence of our community," says Barber, who first experienced Visions of Our 44th President at the Association of African American Museums (AAAM) conference this summer.